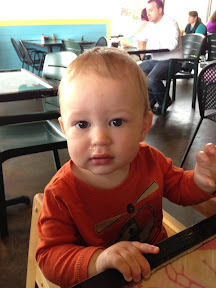 Since his mommy wont blog anymore I will post pics and videos of him! I have showed you pics of his big brother who used to be my yearly date to lunch but since he is getting so big they make him go to school now and I get this little man all to myself and I miss the other one so much. 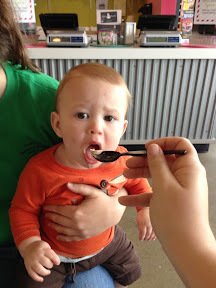 He was a great lunch date, he loves my favorite resturant and chowed down on black beans like a champ, and then it was on to yogurt which he also loved. We are like the same person. It was the high five that sealed the deal, he just randomly threw his hands up in the air and expected you to hit it. He also randomly shouted out YeeHaw! randomly throughout the visit. I wish I could have stayed longer but we only had time for lunch. Ok, now where were we. Yes, on time this morning! I made it to class before the music started which never happens to me. It was an hour of Pump and then heavy weights on the legs finished off with some quality cardio. I have been trying to be a little low impact since my joints are aching but I got in a mega burn. Work was another busy busy day, we are approaching the last day of the month and that is the busiest time every single month. I say it every time but I like busy days and other than the 1 hour hold phone call it was a pretty good day. I know even with all the work there was still time to have a few good laughs...at one point I laughed so hard that Im sure I will be sore from it tomorrow. After work it was off to Bootcamp. It was brutal today...since it was raining we didn't get that 20 minute run so it was straight to body weight exercises and lots and lots of pushups. I can already tell that my attempt to lift heavy on Monday and Wednesday along with Bootcamp on those days is really breaking down my muscles. Hopefully that will help repair and build bigger muscles and burn more calories every day. In a few more weeks I should know if this new plan is working and if not I will make some changes again. Without trying I will never know. Tomorrow I only get in one workout in the AM so I have to make it count. Tomorrow afternoon I have a crazy afternoon! It will be busy at work and then we start up Softball season and have soccer games. Crazy I tell you! Then the random of the day. First, today I had a Twitter talk with @skinnyrunnerSR and @sarahoual, two of my favorite bloggers and I just happened to dream about them last night and talk about it on twitter and they both responded back, its so exciting. You know me and my new BFFs! Second, can someone tell me where they store their road bike. I cant even dream of leaving it outside and I dont want to put it in the dirty garage but it looks strange in my living room so right now it has set up camp in my utility room. 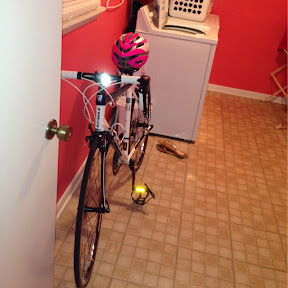 That works for now cause I spend too much time in that room anyway so now I get to gawk at my bike at the same time.